John Updike once wrote that many of his works are "illustrations of Kierkegaard," and yet no current study provides an extended, convincing reason why this is so, why Updike came to live by Søren Kierkegaard's ideas. This study does, telling the story of Updike's life-altering encounter with Fear and Trembling in his early career, and tracing the subsequent evolution of Updike's complex and coherent theology. 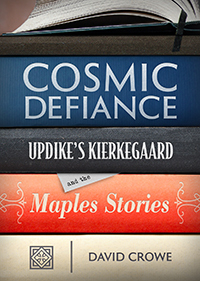 Examining Updike's many claims about Kierkegaard's life and work, and casting those claims into debate with Kierkegaard's best scholars and critics, this book explains why Kierkegaard and his intellectual inheritors Karl Barth and Miguel de Unamuno provided Updike with a reason to live, and a vocation as an antinomian Christian writer. The study pursues the same question Updike did: how are identity and action bound up with faith in God? The eighteen intensely autobiographical Maples stories, chapters in the tale of a twenty-two-year marriage that begins hopefully but ends in divorce, epitomize the theological preoccupations Updike learned from Kierkegaard—becoming an authentic self and learning to love the neighbor creatively rather than compulsively.